View this sample resume for an MBA, or download the MBA resume template in Word. Your resume needs to be mean business. To be considered for top MBA jobs, resume expert Kim Isaacs says it helps to have a comprehensive resume that showcases your skills and achievements. 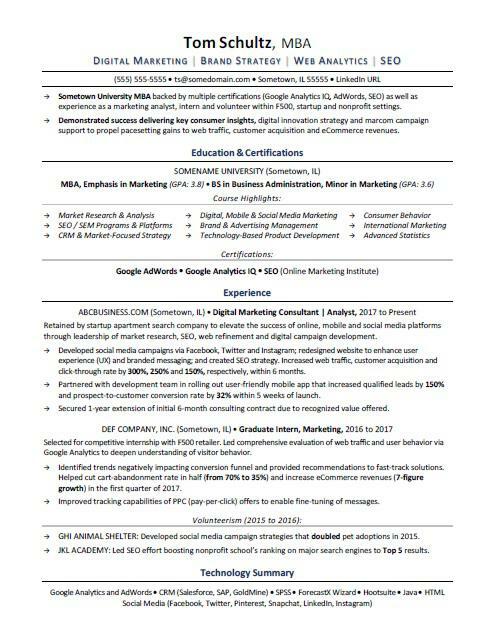 For resume writing tips, view this sample resume for an MBA graduate that Isaacs created below, or download the MBA resume template in Word. And if you need more help, get a free resume evaluation today from the experts at Monster's Resume Writing Service. Additionally, you can learn about business careers and search for MBA jobs on Monster. Sometown University MBA backed by multiple certifications (Google Analytics IQ, AdWords, SEO) as well as experience as a marketing analyst, intern and volunteer within F500, startup and nonprofit settings. Demonstrated success delivering key consumer insights, digital innovation strategy and marcom campaign support to propel pacesetting gains to web traffic, customer acquisition and eCommerce revenues. Retained by startup apartment search company to elevate the success of online, mobile and social media platforms through leadership of market research, SEO, web refinement and digital campaign development. Developed social media campaigns via Facebook, Twitter and Instagram; redesigned website to enhance user experience (UX) and branded messaging; and created SEO strategy. Increased web traffic, customer acquisition and click-through rate by 300%, 250% and 150%, respectively, within 6 months. Partnered with development team in rolling out user-friendly mobile app that increased qualified leads by 150% and prospect-to-customer conversion rate by 32% within 5 weeks of launch. Secured 1-year extension of initial 6-month consulting contract due to recognized value offered. Selected for competitive internship with F500 retailer. Led comprehensive evaluation of web traffic and user behavior via Google Analytics to deepen understanding of visitor behavior. Identified trends negatively impacting conversion funnel and provided recommendations to fast-track solutions. Helped cut cart-abandonment rate in half (from 70% to 35%) and increase eCommerce revenues (7-figure growth) in the first quarter of 2017. Improved tracking capabilities of PPC (pay-per-click) offers to enable fine-tuning of messages. GHI Animal Shelter: Developed social media campaign strategies that doubled pet adoptions in 2015.